Product Model: PX4i. Product Family: EasyCoder PX. Product Line: EasyCoder. Product Type: Thermal Transfer Printer. Maximum Mono Print Speed: 304.80 mm/s. Maximum Print Resolution: 300 dpi. Continuous Label. Specialist in Printer and Copier Consumables. 1 x NEW OEM Canon Waste Toner Case FM4-0905-000 Image Runner Advance 6055. 1 x Original Unused Sharp MX-70GTYA Yellow MX -6201N. 1 x OEM Xante Impressia Black Toner 200-100323 Ri coh SP820 Equivalent 840812. Evolis Badgy 100 plastic card printer Dye-sublimation/Thermal transfer Colour 260 x 300 DPI - B12U0000RS. - Evolis Badge Studio software, standard version;. Card feeder Yes. Ending Soon. The Badgy100 printer is ideally suited to your single printing needs and is perfect for limited budgets. GK420t USB. Direct thermal or Thermal transfer, (with or without a ribbon) label printer withUSB Interface complete with ZPL programming language, Inc USB cable, user and programming manuals and basic Zebra Designer label creation software/ windows drivers. Direct Thermal and Thermal Transfer Capabilities. Parallel connection. Print up to 100mm per second. We will always go out of our way to source the product you are looking for. Add to Favourites. NO RIBBON SUPPLIED. The Wasp WPL614 includes a 2-year manufacturer's warranty covering material defects. Product Model: WPL614. Form Factor: Desktop. Product Type: Direct Thermal/Thermal Transfer Printer. Maximum Mono Print Speed: 356 mm/s. Manufacturer Part Number: P1004230. Product Model: P1004230. Product Type: Printhead. Get the best performance from your Zebra printer by usingQualityZebra supplies are made by Zebra, for Zebra printers, to the highest standards. Manufacturer Part Number: G57242M. Product Model: G57242M. Product Type: Printhead. Get the best performance from your Zebra printer by usingQualityZebra supplies are made by Zebra, for Zebra printers, to the highest standards. Product Model: WPL614. Form Factor: Desktop. Product Type: Direct Thermal/Thermal Transfer Printer. Maximum Mono Print Speed: 356 mm/s. Maximum Print Resolution: 203 dpi. Product Type: Direct Thermal/Thermal Transfe. Product Model: ZT410. Keep your critical operations running efficiently with Zebra's durable ZT400 Series printers,designed for years of performance in a wide array of applications. And, they include standard USB, Serial, Ethernet and Bluetooth- capabilities. Print technology Direct thermal / thermal transfer. Print speed 254 mm/sec. Form factor desktop. Weight 13.3 kg. Height 265 mm. Depth 490 mm. Width 255 mm. Emulations Datamax I, DMX400, ZPL-II. A wide range of peripherals and software enable specific customized solutions. Regardless of whether they are operated in stand-alone mode, in a PC application or in a network – the solid SQUIX printers are always up to the mark. Manufacturer Part Number: G79058M. Product Model: G79058M. Product Type: Printhead. Get the best performance from your Zebra printer by usingQualityZebra supplies are made by Zebra, for Zebra printers, to the highest standards. PC43d / PC43t features a multi-language LCD or Icon-graphics user interface for maximum ease of use. PC43t, Icon, Latin Font, 300DPI, EU cord. D Mark, cUL, CCC (China), KCC (South Korea). Ending Soon. Cab A4 M 300 dpi Thermal Transfer Heat Shrink Printer. Print resolution 300 dpi. Heat shrink tube range 3,5 - 110mm. The layout of the markers is created either with the label software or directly on the PC. Full or partial cut autocutter (centre). Ending Soon. Print technology Thermal transfer. Storage relative humidity (H-H) 10 - 90%. you can buy in set of 6 max. - Black mark sensor for fixed length labels and tickets. Zebra GC420t. Search Google zebra gc420t. Thermal Direct /transfer. Label Printer Tested, and working. Zebra Designer software and drivers. You will receive one in similar condition to the printer pictured. PM43, 203DPI, Ethernet, IEEE 802.11 a/b/g/n, Thermal Transfer, EU cord. Ending Soon. Maximum resolution 203 x 203 DPI. Print technology Thermal transfer. And with comprehensive command language support – including ZSim2, our fast, friendly and complete ZPL-II emulation – upgrading to PM series has never been simpler. Bixolon SLP-TX420 Thermal Transfer Label Printer. SLP-TX420E/BEG - Serial/USB/Ethernet (Light Grey). Direct thermal / thermal transfer. Up to 178mm per second print speed. Label printing on paper of between 0.06 - 0.20mm thick. Manufacturer: Citizen Micro HumanTech. Product Family: CL. Form Factor: Desktop. Product Series: CL. Product Type: Direct Thermal/Thermal Transfer Printer. Maximum Mono Print Speed: 150 mm/s. Maximum Print Resolution: 203 dpi. 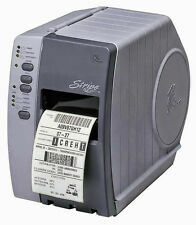 The ultra compact TLP 2824 Plus bar code label printer, brings powerful performance to applications. It includes a processor for faster formatting and first label out, an auto sensing serial port. Product Model: TLP 2824 Plus. 203 dpi, 8 dot, 104 x 991 mm, 32-bit RISC, 8MB Flash, 8MB SDRAM, USB 1.1, RS-232, Parallel, EPL/ZPL, 1500 g, White. Maximum resolution 203 x 203 DPI. It also includes both EPL2™ and powerful ZPL II® programming languages—making it easy to integrate with other Zebra printers. Maximum Print Resolution: 203 dpi. Form Factor: Desktop. Product Type: Thermal Transfer Printer. Maximum resolution: - DPI. Storage relative humidity (H-H): 5 - 95 %. Maximum Mono Print Speed: 152 mm/s. The GX420t has a sleek and compact design, boasts the easiest ribbon loading system on the market, and supports a variety of applications and industries. 203 dpi, RS232/USB/Parallel, 8MB SDRAM, 4MB Flash, 2.1kg, Grey. Product Model: ZD620. Product Type: Thermal Transfer Printer. Manufacturer: Zebra Technologies Corporation. Maximum Mono Print Speed: 203 mm/s. Continuous Roll. Maximum Print Width: 104 mm (4.09"). Maximum Print Resolution: 203 dpi. ZT230 Industrial Printer, TT, ZPL, 203Dpi, RS232, USB, 128MB Flash. ZT230 Industrial Printer. The easy tool-less platen and print head removal makes it easy for operators to maintain the printer. Maximum resolution 203 x 203 DPI. PM23c, 8 dots/mm (203 dpi), ZPL, IPL, USB, RS232, Ethernet. Maximum resolution 203 x 203 DPI. Ending Soon. Print technology Direct thermal / thermal transfer. Perform – Increase productivity and process efficiencies with a printer that’s simple to use. The GL4e series is SATO's significant release of printing technology. Print Resolution: 305 dpi (12 dots/mm). Communication Interface Standard: IEEE1284 (ECP Compatible), RS232C, USB (2.0). Wind Orientation: Face In or Face Out. SLP620-UK, 203 dpi, 70mm/s, USB. Maximum resolution 203 x 203 DPI. Ending Soon. The Smart Label Printer® 620 is user friendly and the ideal entry-level model to organize your daily workload in the office. Bixolon SLP-TX420 Thermal Transfer Label Printer. SLP-TX420/BEG - Serial/Parallel/USB (Light Grey). Direct thermal / thermal transfer. Up to 178mm per second print speed. Label printing on paper of between 0.06 - 0.20mm thick. Product Type: Thermal Transfer Printer. Manufacturer: Zebra Technologies Corporation. Maximum Mono Print Speed: 152 mm/s. Manufacturer Part Number: ZD42042-C0EW02EZ. Images shown are for demonstration purposes. The GX420t has a sleek and compact design, boasts the easiest ribbon loading system on the market, and supports a variety of applications and industries. 203 dpi, RS232/USB/Parallel, 8MB SDRAM, 4MB Flash, 2.1kg, w/Dispenser, Grey. 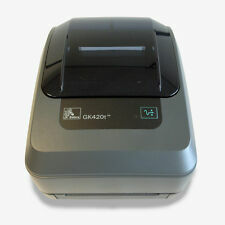 Bixolon SLP-TX420 Thermal Transfer Label Printer. SLP-TX420C/BEG - Cutter/Serial/Parallel/USB (Light Grey). Direct thermal / thermal transfer. Up to 178mm per second print speed. Label printing on paper of between 0.06 - 0.20mm thick. Product Model: ZT610. Manufacturer: Zebra Technologies Corporation. Product Type: Direct Thermal/Thermal Transfer Printer. Maximum Mono Print Speed: 356 mm/s. Network & Communication. Maximum Print Resolution: 300 dpi. Product Type: Printhead. Thermal Transfer. Print Technology: Direct Thermal. Manufacturer Part Number: 1-010043-900. Product Model: ZT410. 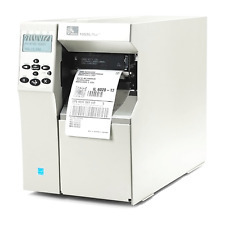 ZT400 printers feature USB, Serial, Ethernet and Bluetooth®connectivity along with expanded RFID capabilities. Manufacturer: Zebra Technologies Corporation. Keep your critical operations running efficiently. Product Model: ZT620. Manufacturer: Zebra Technologie Corporation. Product Type: Direct Thermal/Thermal Tranfer Printer. Network & Communication. Maximum Mono Print peed: 305 mm/. Maximum Print Reolution: 300 dpi.